Kids Cooking Lessons for 7-11 year olds chef in training Lesson 2. For today's kids cooking lessons show your chef in training how to crack an egg. Let them practice. Don't forget to instruct them on how to take egg shells out also! Tip-crack on a flat surface like the counter instead of a sharp surface such as a side of a bowl. Once your chef-in-training gets good at cracking eggs, you can show him/her how to separate the yolk from the egg white. Crack eggs into bowl. Sometimes it is better to do one egg at a time in a measuring cup and pour into a bowl. Check for any shells in the cup. Stir in milk, chopped ham and cheese. Blend together. Let adult cook in pan or supervise kids while they cook stirring back and forth in pan until cooked through. You can also add chopped peppers, zucchini, onions or other vegetables your child likes. 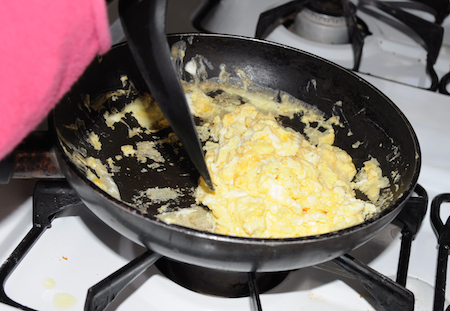 When using eggs during cooking always make sure you follow good hand washing and kitchen sanitation. This is a good time to reiterate this lesson. 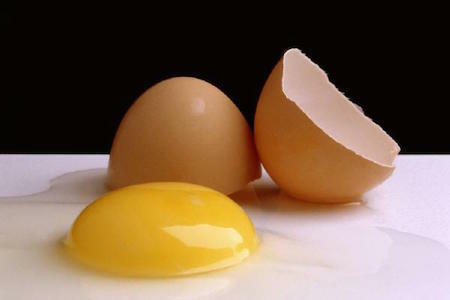 Don't forget to clean counter tops and dishes well after using raw eggs.